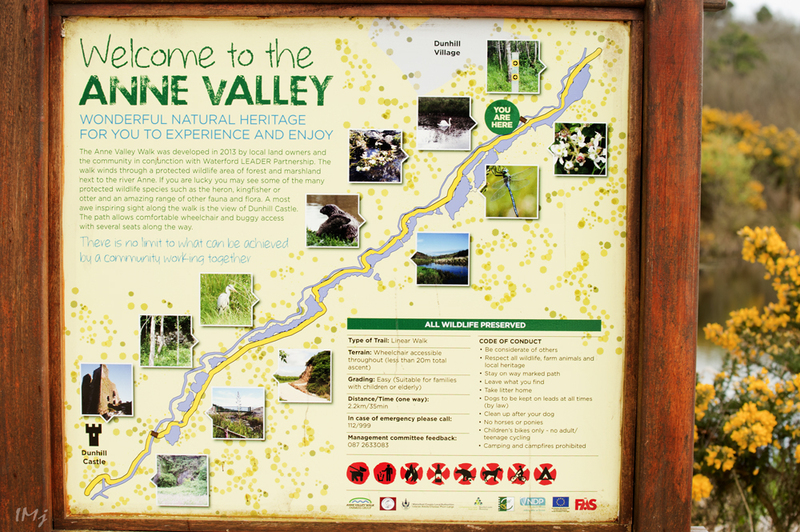 Dunhill village is a home for Anne Valley Walk, a 2.5 km trail that travels from Ballyphilip bridge to Dunhill Castle. 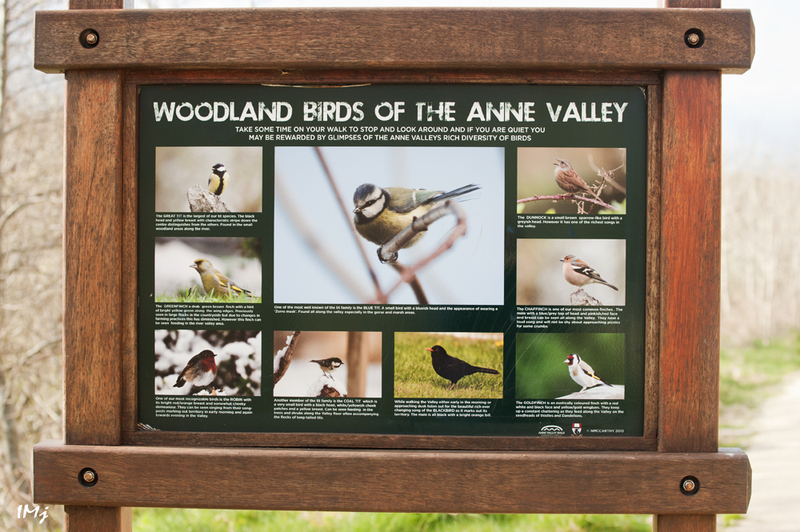 This beautiful trail through the Anne Valley was officially opened in 2013 and took a huge amount of voluntary work to complete. The blue patches on the map are the man-made ponds that transformed the area from a marshland to a comfortable walking environment. The route takes some 50 minutes to complete if you don’t want to see the castle ruins. 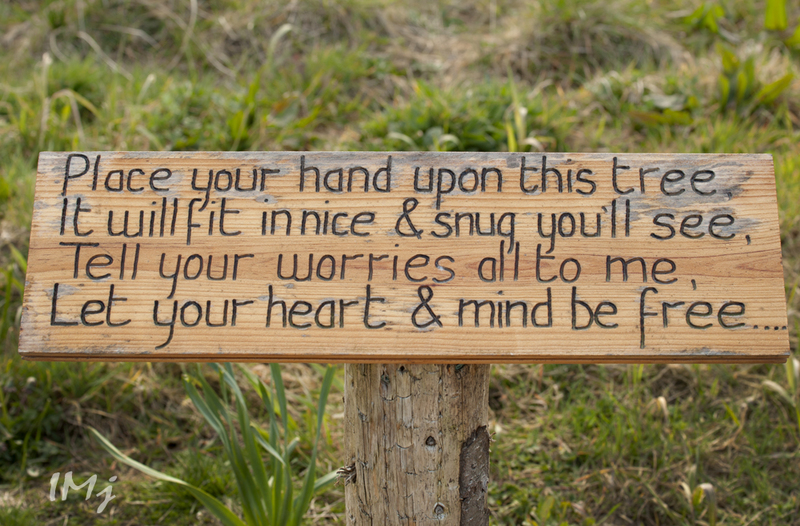 The Fairy doors are at the other end of the trail – cute and very inviting. I am sure the fairies find a shelter here on their travels, and I feel like I walk through the doors too. If you have worries, there is a place to leave them. The tree stump will sort it out for you. 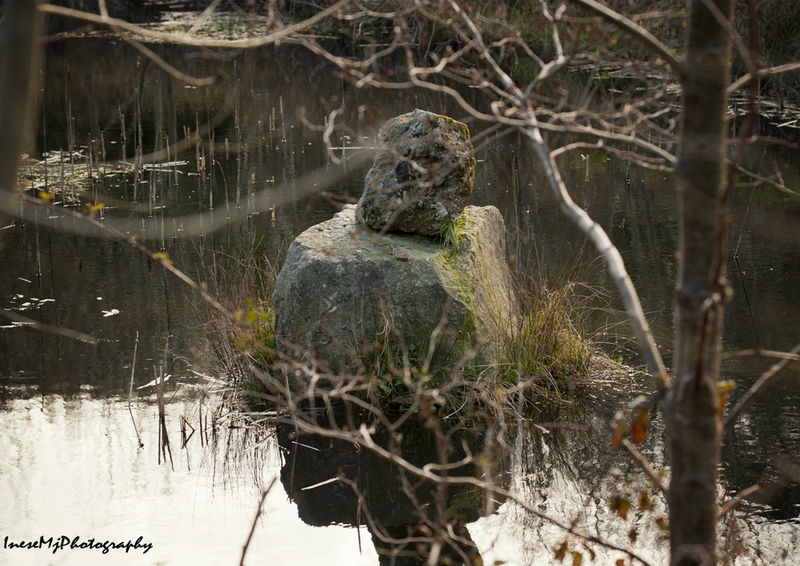 This menhir stands in the pond and looks authentic. 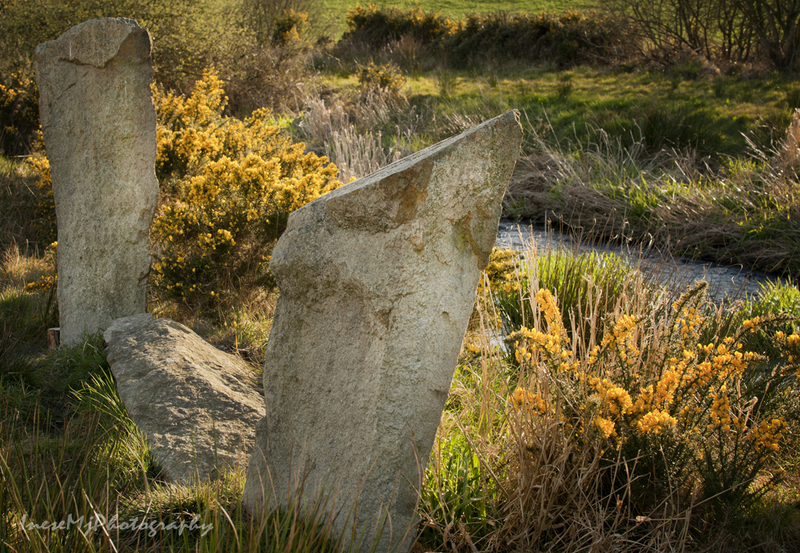 I couldn’t find any information, probably the stone was standing in the bog before the ponds were made. I don’t know anything about these either. This one looks mysterious, it is difficult to spot from the trail. The picture was taken in early spring before the foliage obstructed the view. Anne River is gurgling under the bridge, reflecting the sky. 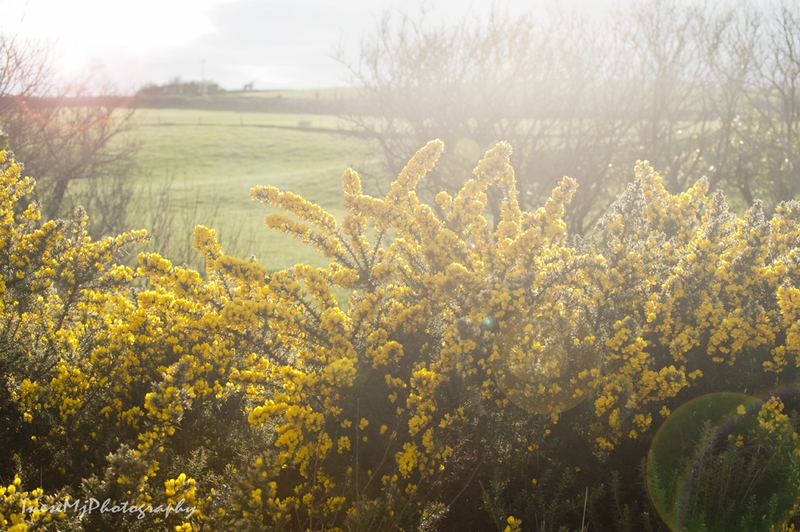 In the late afternoon, the sun makes everything look golden, and the air is filled with musty fragrance of golden gorse. Flora of the marshlands is still present. 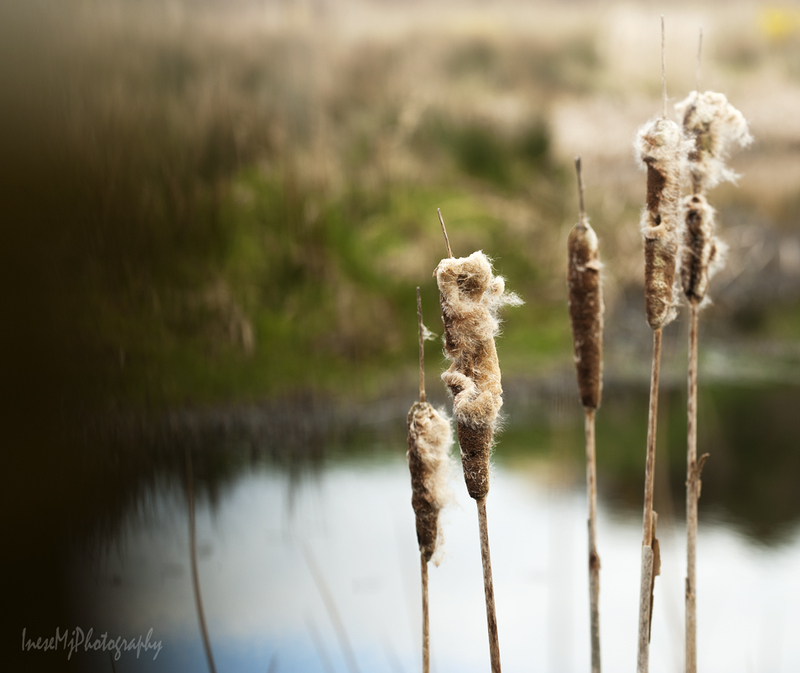 Birds use the silky seed hairs of Reedmace (Cattail) for lining their nests. I have seen most of these birds. Best time for bird-watching is early morning, before the dog walkers scare them away. I have read that there is a kingfisher living somewhere. I hope he is. Of the mammals, I saw an otter one evening. Swans, herons and egrets are the biggest birds seen around Anne River. This photograph looks funny and I am not sure if I should have posted it. Because of the darker feathers on his chest, the heron looks like a sticker cut off with scissors and glued to the picture. It is the same heron. Two photographs were taken within just a few seconds. 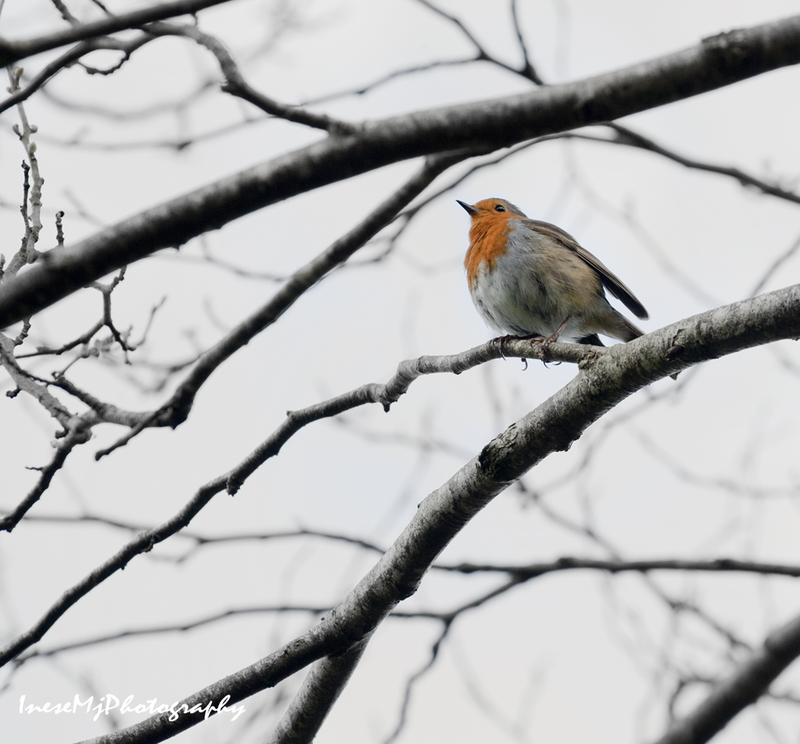 European robin is one of my favorite birdies. 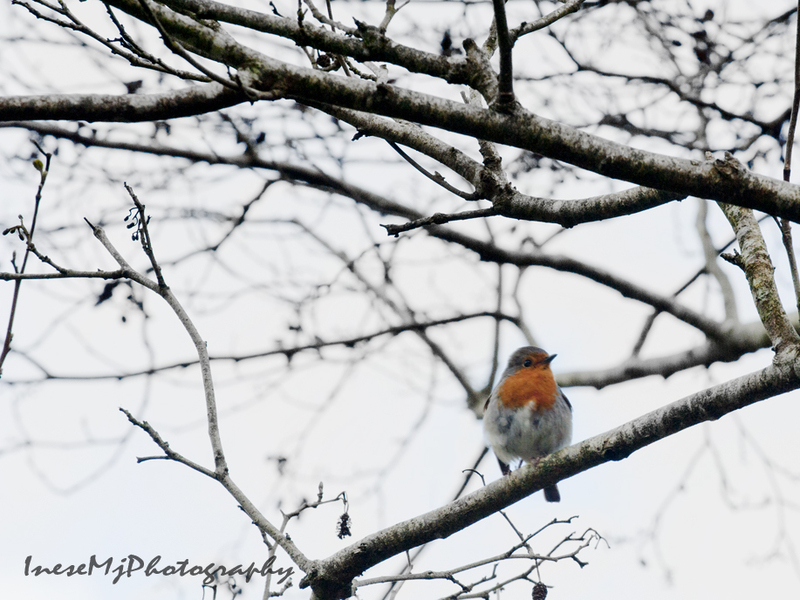 This one was very friendly and sang me a song. I wonder if this is the same bird. I met these ducks just minutes before a tragedy struck their family. Have a closer look. Some ducklings are light-grey and have big, round heads like their mama, and the others are dark brown and have a dark stripe across the eye. The brown ones look like Mallards, but the grey ones are different. 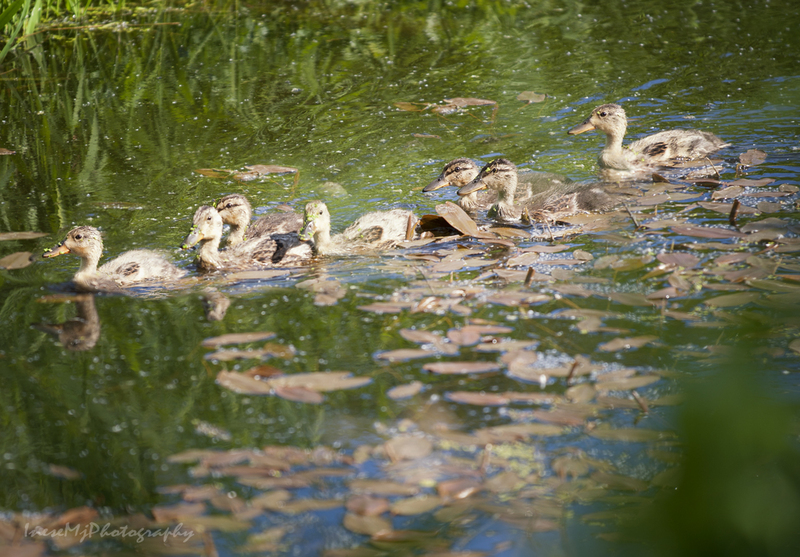 Anyway, twelve ducklings had hatched, but the day I took the picture there were just seven. They were picking on something in the grass, and their mama was watching. I took some pictures and walked away. 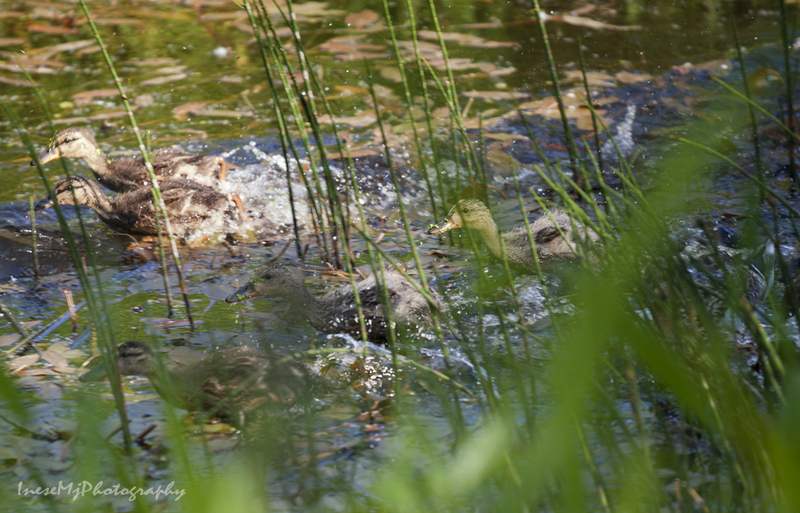 After a moment I heard a duck quacking in distress, then came a loud splash, and then, with loud quacking and splashing and wing flapping, the ducklings run in the water towards me. Little legs got tired very quickly and they finally stopped running and swam – it is when I took this picture. They didn’t make any sound, but swam very fast. Mama duck started quacking again, and the ducklings quickly ran past me. The darker ones seemed stronger and the lighter ones were left behind. Tall weeds didn’t let me see what was happening, but I ran behind the ducklings to the bridge. Finally mama duck flew past me too, quacking like crazy. From the bridge I saw them all gather together, mama duck still quacking. 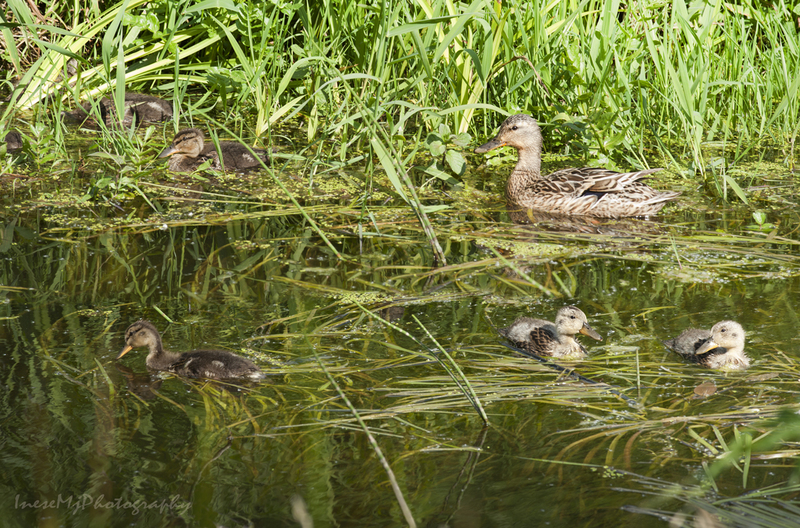 I counted the ducklings – there were six. One didn’t make it. The ducks swiftly swam away but I was still standing and waiting for that one. He never showed up. Anne River has her dark secrets. 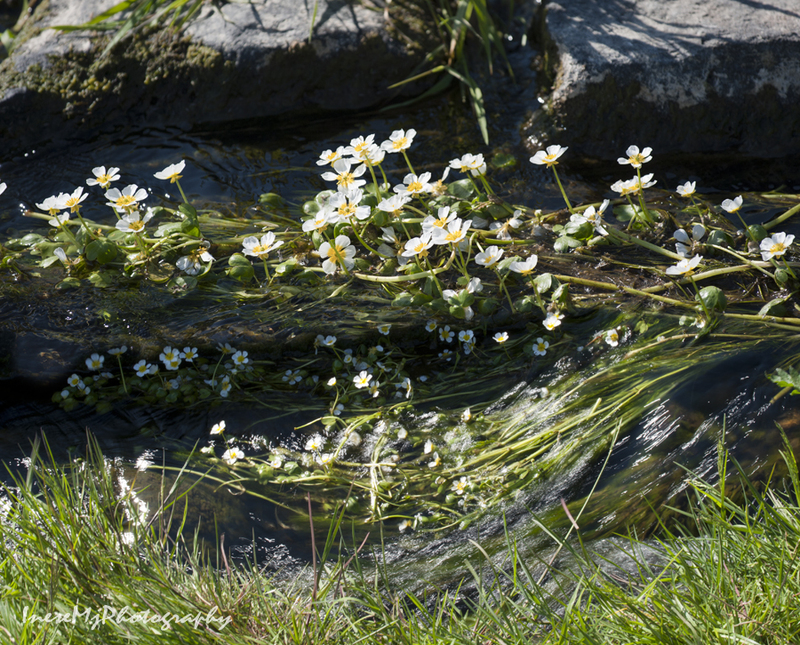 These strings of Water crowfoot plant look like something woven by river Nymphs. 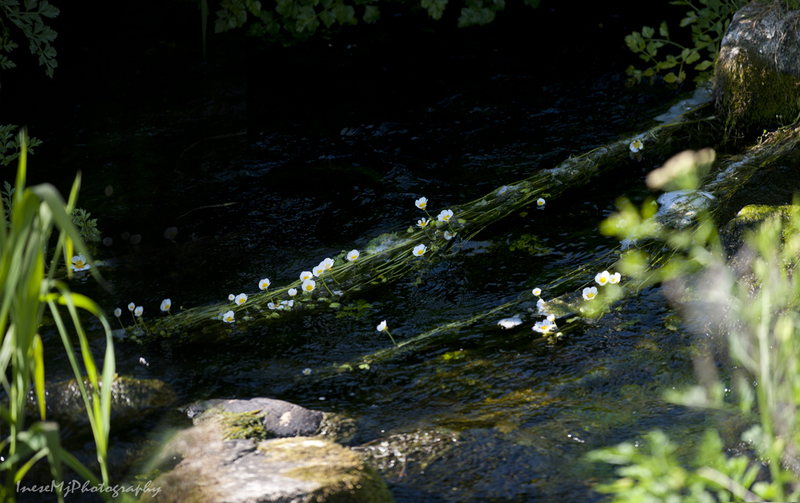 White flowers seem fluorescent under the dark canopy. A river doesn’t have to be deep and wide to be beautiful and important. I will write more about Anne River and Dunhill in my next two posts. Thank you so much for taking a walk with me. More adventures to follow. I will do something about that ;). 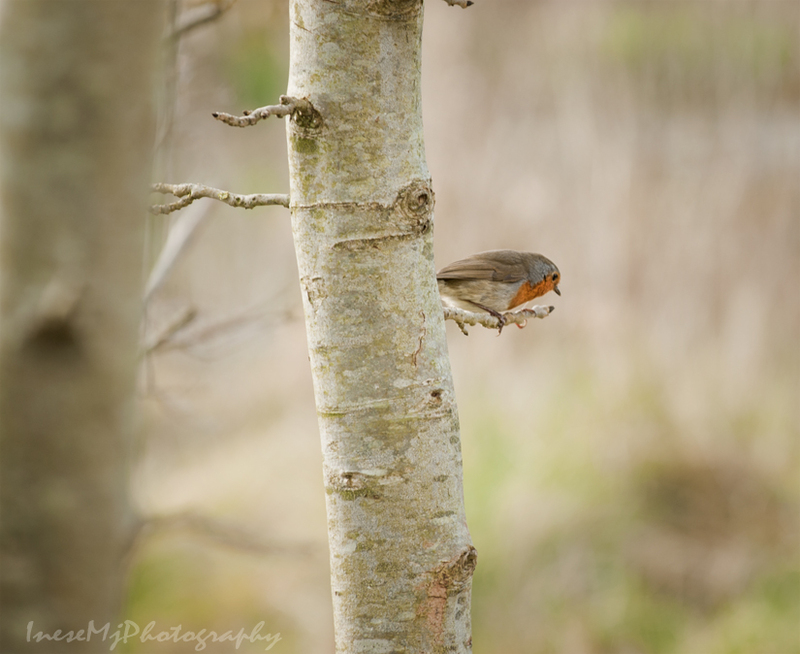 In a couple of days I am off to my personal Fairy Land, and we might have some photo session with fairies. I will keep posting stuff because I have it already written and scheduled, but I might be online only sporadically, when I have time. I was given a fairy door for Christmas. I must put it out somewhere but I would have put it at ground level. Perhaps I should do as in your photos. Lovely bird and duck shots, by the way. Thank you so much! 🙂 Poor ducks, they have too many enemies. I love Fairy Doors, they look cute on a tree. One tiny nail won’t hurt the tree. 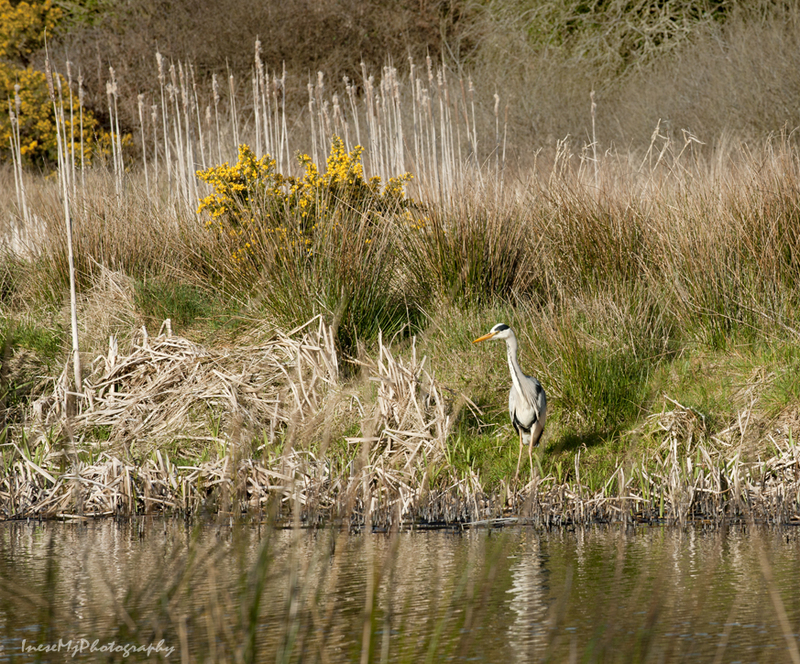 Superb shot of the heron . . . . . . I suspect the fairies could tell you all about the stones! Thank you! The fairies are my only hope 🙂 I messaged to the Anne Valley Walk Facebook Page, but they never got back to me. oh that’s a shame but perhaps they are waiting for the fairies to get back to them!! 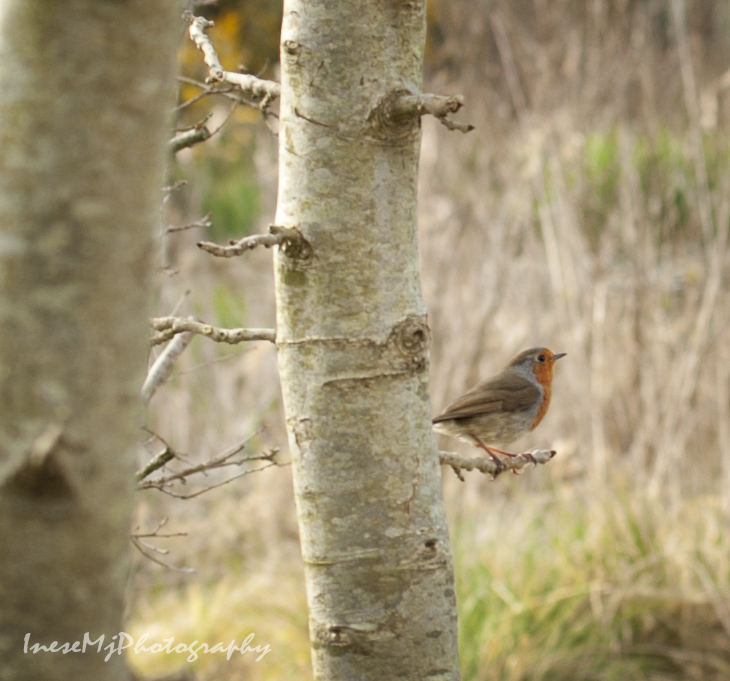 Thank you so much for linking to my post! Have a happy week! Thank you so much, Margaret! Haha, pterodactyls, it is what I think of them too. Grave and funny look, clumsiness and arrogance – all mixed together. I love them! This is beautiful! I had no idea where Anne River was. 🙂 Can I share it on my Monday walks? Your photos and the little drama of the ducklings are great. Hello! I’ve been following your weblog for some time now and finally got the courage to go ahead and give you a shout out from Atascocita Tx! Oh, how beautiful and sad. I wanted to cry for the lost duckling. Places like this have such a strange mix of fragility and power, don’t they? It made me think of a story my dad once told of how he had been playing near a small river with friends, and fell in. It may have been just a river, but it was fast and deep, and my grandfather, who never learned how to swim, leapt into the river to pull my father’s limp body out. I can understand why so many cultures believe in river spirits. They are powerful. Finicky. And always unpredictable. Thank you so much for your kind comment, Jean! 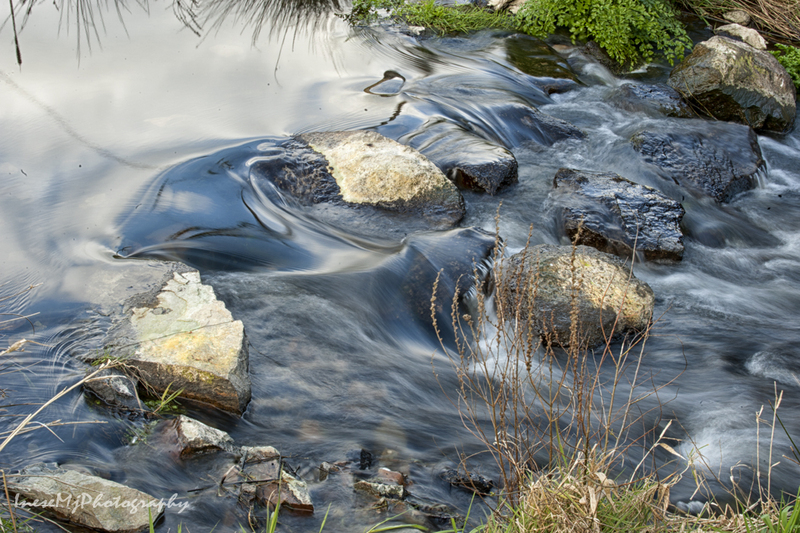 What a powerful story about your grandfather… and I do believe in river spirits. I know they protected me, at least once. 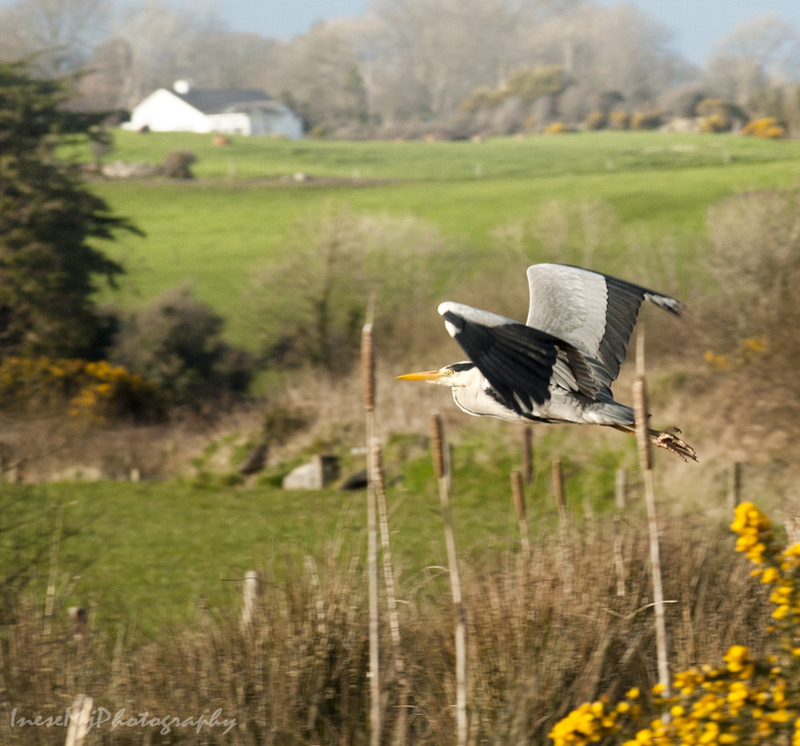 The bird shot looks funny because the heron was too slow 🙂 There is no proper motion blur in the picture, and he looks like a sticker. 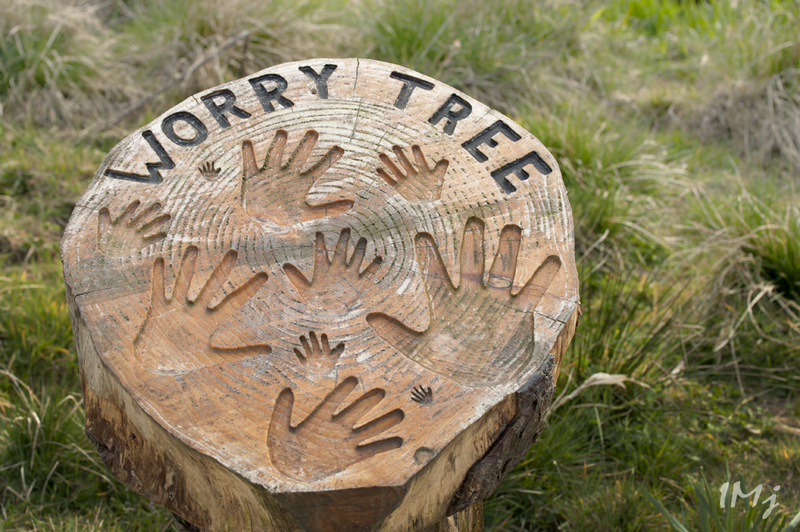 What a wonderful walking project! Your photos are inspiring as was the nature around you. Did you tour the castle? Thank you so much for your comment! I did walk to the castle. It is just a ruin, but I will write about it in my post this Saturday. 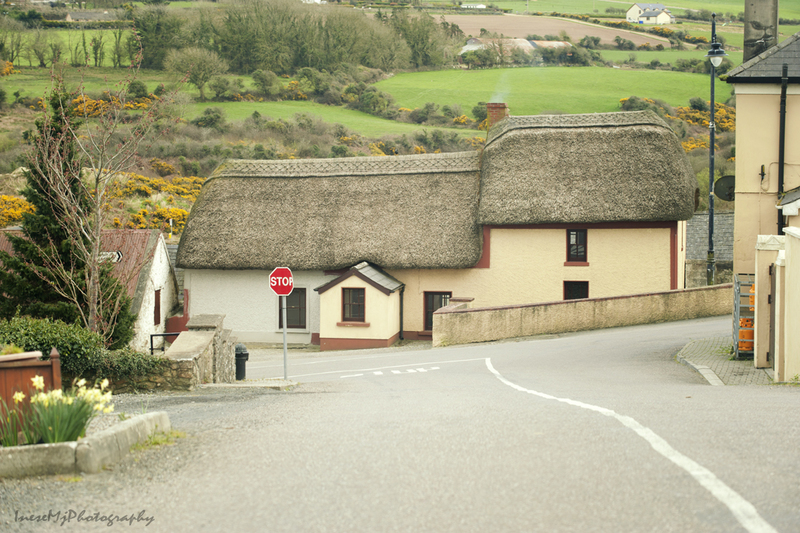 All the area looks like a fairy tale. How enchanting… although I miss the missing ducks!